When Should You Expect Your Lawyer to Predict a Settlement Value for Your Case ? When speaking to prospective clients, I often get the questions "what is my case worth?" and "when will my case settle? I cannot think of any situation where I would be able to answer this question truthfully before I would have an opportunity to dig into the file and read all of the medical records. I think that any lawyer who throws numbers and dates at you is not being straight with you because there are so many factors that influence the timing and settlement value of your case. This about it this way – if you were to drive your car into a repair garage, would you expect the mechanic to diagnose exactly what is wrong with your car before driving it or opening the hood? When I open a new file, the medical record often is not very complete. Many times no objective testing – MRI, CT scan, even x-rays – have not been done. Objective testing helps doctors and judges evaulate the severity of your injuries. A herniated disk or a broken bone will be much more compelling evidence than a generalized pain syndrome and thus impact settlement value. I would also want to know who your authorized treating doctors are. 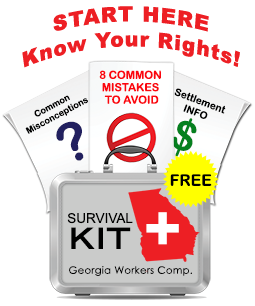 Over the years, I have become very familiar with many of the doctors in North Georgia who handle workers compensation claims. If your treating doctor is very conservative and is likely to return you to work with no restrictions, your settlement value will be affected. If I see an angle to argue for a change in treating physician, your case will be more valuable. In my experience, claimants sometimes don’t realize just how seriously they are hurt. If you are having excruitating pain in your back, you might not think abuot that nagging ache in your heel – but down the road, your heel problem and resulting inability to walk could have a more lasting impact on you. A big part of my job is to ask the right questions based on what I would expect to see given a particular injury. Shoulder pain may mask a neck injury. Knee pain may mask foot problems. Along these lines, as your case develops I will be thinking about whether you will be able to return to your past work, whether your employer is likely to create a job to accommodate you and whether you will be able to return to a job where you can earn close to what you have earned before. In my view, the timing of our settlement demand i crucial, and the decision about when to talk settlement will be the result of a lot of discussion between you and me. My job as your counsel is to give you the pros and cons of settlement and to help you make a good decision for yourself and your family.